We have gotten a report that the salmon have returned to the Chase River and are swimming up it. They are Chum salmon and can be seen if you walk down to the end of the board walk. Check them out! 147 Haliburton, near Milton Street, with a back yard full of piles of assorted waste. Currently in the process of clean-up. An interesting fact: the city’s jurisdiction does not cover pure overgrowth, as annoying as it may seem to you. But overgrowth can attract squatters and the garbage and waste they leave behind can get tangled in the overgrowth, creating an unsightly situation. The city can then contact the owner, and a clean-up of the debris usually entails a complete clearance of the property. Also, at the Oct. 4 Council meeting, an application related to the rebuilding of the burned house at 990 Milton (corner of Irwin has been made). There was some discussion about the size of the house (postage stamp sized lot). Council approved the initial plans. Demolition happening shortly. 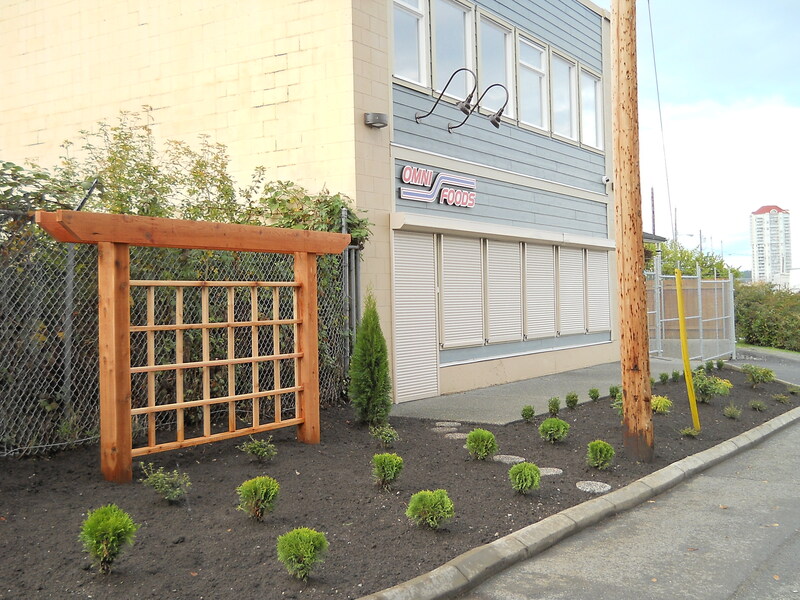 Check out the new landscaping job Omni Foods is in the process of adding in front of their Fry St. operation. Looks great! The Value Lodge on Nicol St has greatly improved over the past few months, calls for service have decreased substantially, but is still holding its designation as a nuisance property. The nuisance designation has been removed from 217 Irwin Street, since there have been no complaints received over the past year. In the meantime, look for city staff in orange vests over the next month, checking the trees for structural pruning. Both Robins Gardens and 13 Haliburton projects are still underway, but navigating big paperwork phases. City council approved signage that will be erected at 9 Nicol Street, the edge of the Port Place Mall property. It will look similar to many city developments, with information and pictures about the planned redevelopment on the property. The development permit at 119 Haliburton has run out, but owners have applied for a reissuance. Our regular monthly meeting will be Wednesday November 3 @ 7 PM at the Princess Royal Centre, corner of Farquhar and Irwin. A Christmas chance to meet all our SECA buddies. The Annual General Meeting will be Wednesday December 1 at 6.00 PM We all bring pot luck finger food and keep the business part short – review of past year and election of Directors. Any member wishing to join the Board of Directors please get in touch with Douglas or Gord. The October SECA meeting was very informative; Jack Stephens, CEO Hans De Visser CEO, and Mill Manager John Hesketh of Coastland Wood Industries gave presentations and answered questions. History: We found out that Coastland started in 1988. At that time, veneer mills used large logs. Coastland pioneered the use of small trees, something of special importance due to the disappearance of the old growth. They are the North American leader in this technology, have 120 workers, and the plant functions 24 hours a day, 6 days a week. The veneer is used in the manufacture of plywood and other new wood products, (laminated veneer lumber) some of which are stronger than steel. The Present: Coastland has to turn increasingly to smaller logs as the Japanese are buying up the large and better quality raw logs, but the company continues to develop the new technology necessary to keep up. Although the market for wood products is down, Coastland is going to hang in and continue finding new ways of producing and marketing veneer. Hog Fuel Burning: Jack Stephens spoke at some length about the hog fuel burning system at the mill. The fuel is used to heat the water into which the logs are placed to soften in order to slice off the veneer with a specially built lathe. Prior to the use of hog fuel, natural gas was burned for this purpose, but this was increasingly expensive. The new burner uses the bark from the mill logs. A precipitator was also installed to keep down particle emissions. The national standard for such emissions is 120 parts per million, Coastland is aiming for 20 ppm. At the end of the first year the count was reduced to 21.2 ppm, much lower than permitted standards. CO2 emissions are also very low. One major problem was burning bark from trees that had been in salt water. This bark caused many difficulties with the burner, and as someone from SECA pointed out, also has carcinogenic emissions. The mill does not use salt-soaked bark, only fresh bark, and when they do not have enough, buy and truck in it from elsewhere. Caring for the Estuary: The Ministry of the Environment requires that Coastland dredge the area in front of their mill from time to time to eliminate any residue and keep the bay from filling in. low tide on mud flats. Jack said to call him if there is a persistent smell and he will check the mill to see if it is the source of the problem. Noise & Trucking Issues: Several SECA members brought up the trucking problem. One is the noise from trucks being underpowered and gearing up. Another problem is the chip haulers not completely covering their loads with tarps. (Although it was also mentioned that the spillage is a lot less than it used to be.) Coastland said they would look into the tarp problem. The screaming noise is due to the steel conveyor system, which is rapidly being replaced with rubber rollers. This should solve this problem. The future: A new building is also being constructed on site. Some trees will come down along the Haliburton tree screen, but they will be replaced. It is unlikely that this building will change the view very much. Thank you all for taking time out to talk to us. And for taking a collaborative role in our neighbourhood. The focus of this brochure is to familiarize the public with how the Balmoral operates, and to answer the questions that people tend to wonder about the most. This is the handbook given to new tenants. What’s this?? 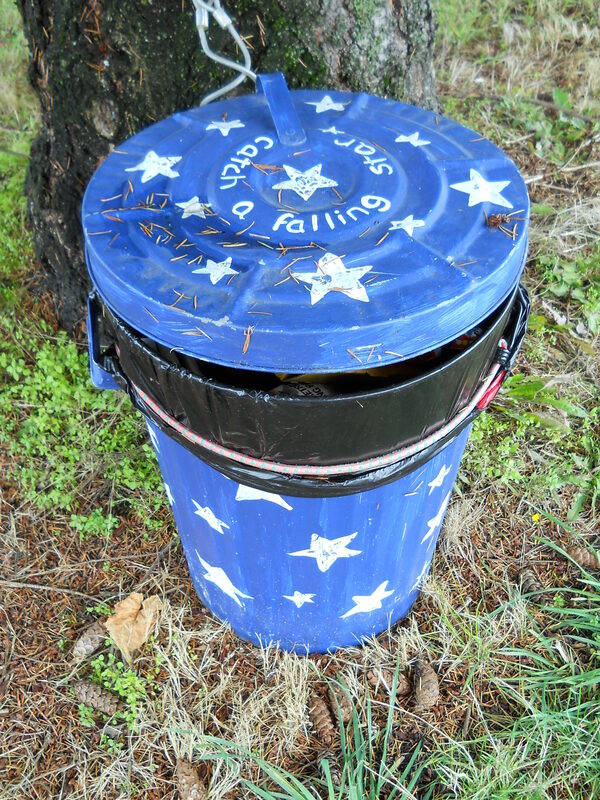 Why it’s Art Bins moseying over and setting up camp around Victoria Road! This brave trio (a.k.a “The Rawhide Bins”) has dared to cross the sometimes treacherous territory of Nicol Street, and has taken up sentry close to each other, ever alert to the neighbourhood enemy…litter. 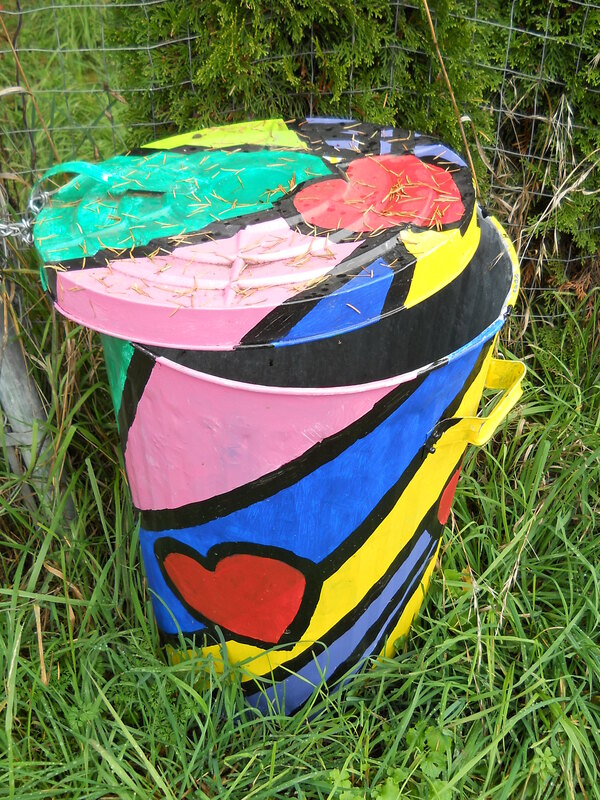 Brightening up the lane between Victoria Road and View Street, this big-hearted bin is the work of one of our most accomplished South End artists. And in the 500 block of Victoria with the big eyeball watching for wafting candy wrappers and those dreaded plastic newspaper straps…! 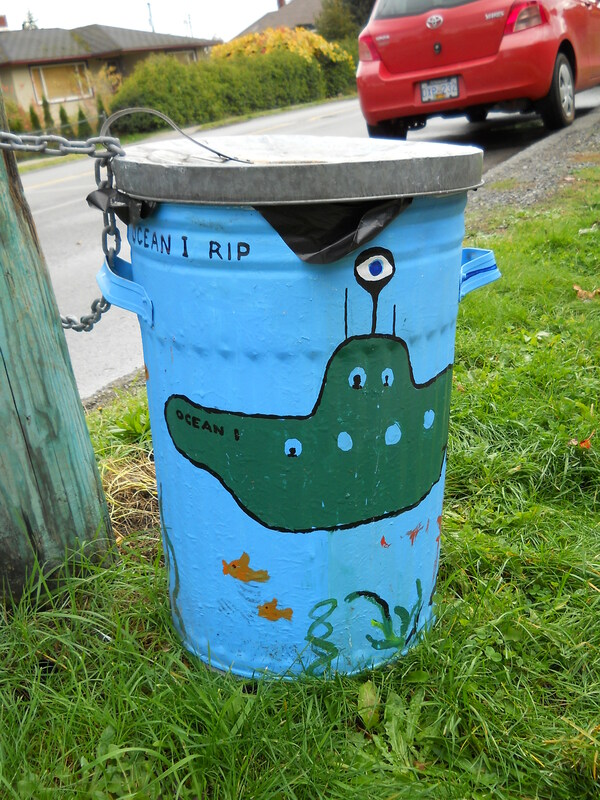 And rounding out the trio, at the 5 way corner, an enterprising homeowner (we’d like to meet) has taken the initiative to paint his/her very own bin. Yay! Yay! Check out Our Shiny New Neighbourhood Plan! The next step in the process is the formal Public Hearing scheduled for Thursday, November 4, 7:00 p.m. in the Council Chambers at the Vancouver Island Conference Centre. You can find a glossary of terms i.e. corridor, neighbourhood, light industrial at the back of the Neighbourhood Plan. Please contact Chris Sholberg at 250-755-4472 if you have any questions regarding the above information or the neighbourhood plan. Editor’s Note: I talked to Chris about the Nov 4 meeting; this is more of a technical meeting. If you do wish to make a specific comment on the plan before Council, please attends; submissions may also be made in writing. After this public hearing, it is anticipated that the plan will be returned to Council for final reading and adoption in mid to late November. Thanks to the City: Our Chair Douglas Hardie made a great presentation at the Oct. 4 council meeting. If you would like to watch it, click here. Some heartwarming comments received, and many thanks given. Move the timer bar at the bottom of the video across to the 1:01 mark. Or click on the 7:58 subheader and listen a few minutes until it begins. The Brechin/Newcastle Neighbourhood Plan is still in process. Their upcoming Open House is November 3, 2010, 4:30pm – 8:30pm at École Océane, 1951 Estevan Road. Have you any leaves that you want to leave your property? A couple of lasagna gardeners would love them for compost. Call Barbara @ 740 0123 . You may know that Cooperative Auto Network (CAN) has maintained shared cars in Nanaimo for over a decade. But CAN is soon ending its Nanaimo operation. So local CAN members and others interested in carsharing have formed a new cooperative association to keep carsharing in Nanaimo.